The essence of brisket smoking is to separate the tissues and increase the delicateness of your delicacy. You also have an opportunity to join experts today and live the rest of your life rejoicing. For the beginners, the following steps are helpful in transforming your smoking experience from a beginner to a pro. Prior to the actual brisket smoking, there are some important points you need to take into consideration. First, your choice of the brisket matters. If you want to experience great results, ensure you buy a tender piece of meat. Check here to select best meat to smoke if you are beginner. You can test the tenderness of your brisket by balancing it into your hands. The more it bends, the tenderer it is. That is your ultimate choice. The fat content, including ample fat marbling and thickness of the fat layer is another determinant of the best brisket for smoking. Higher fat content maintains your meat moist throughout the smoking process. If you are planning to use Masterbuilt electric smoker, approximately 10 pounds of brisket meat is ideal. Massage your rub on the meat, bearing in mind the importance of the rub in determining the quality of smoked meat. The earlier the rub, the better the final quality of meat so, better do it earlier. We recommend doing it in the evening and leaving your meat to stay overnight before smoking. Safely wrap your meat in aluminum foil and leave it to stay overnight. However, if your case is exceptional and you need to smoke urgently, you can rub four hours prior to smoking. Two hours prior to starting your smoker, remove your meat and keep it at room temperature. If you have to enhance your meat flavor with marinade, this is the time to inject it into the meat. But the smoke flavor is nevertheless enough to give you the flavor you desire. Load your wood chip box with the wood chips. Blending apple and cherry wood with hickory helps to balance between the bacony and cherry flavors. For the best quality smoked brisket, this is what we recommend. Hickory wood or even traditional mesquite wood can similarly work. Here, your choice will depend on the exact taste you want. There are some tips for a beginner: You have to ensure all the essential kitchen tools in your hand. And you have to know what grilling mistakes usually do a beginner. 1 packer brisket split between flat and point. 1 bottle Patriot's BBQ beef and your most preferred rub. Spicy browns mustard weighing approximately 3 to 6 ounces. Apple juice for basting and bath. Beer (for cooking and bath). 1 tablespoon of dried onion flakes. When your Masterbuilt electric smoker is 225 to 230 degrees F and wood chips already burning, you’re set to go. The right procedure on how to smoke brisket in Masterbuilt electric smoker starts with fat side up. This maintains your brisket tender as the fat melts sin the course of smoking. We recommend ideal cooking duration of one hour per pound of meat. The best part of a digital Masterbuilt electric smoker is that you can run other errands as you smoke. All you need to ensure is that the internal temperature remains constant throughout the smoking duration. If you are smoking 10 pounds for instance, you will need at least 10 hours to complete your smoking. Masterbuilt electric smoker is stress-free. Your task is to full the unit with sufficient wood chips and come back later for your smoked product. Keep on monitoring the internal temperature of your meat as you smoke. If your Masterbuilt electric smoker is compatible with a food meat thermometer, it is even advantageous to you. At 140 degrees Fahrenheit, start spritzing apple juice on your meat at an interval of 2 hours. At 165 degrees Fahrenheit, you can foil your meat with the last apple juice spritz. We recommend smoking up to 140 degrees Fahrenheit internal temperature for both home and commercial consumption. However, depending on the preferences of your customers, you may either go slightly below or beyond 195 degrees Fahrenheit. Remove your meal from your Masterbuilt smoker and wrap it in towels. For about 30 to 45 minutes, allow your meat to cool in an insulated container. The resting time allows for the dropping of internal meat temperature, thus maintaining juiciness of your meat. Now you are clear about how to tell when smoked brisket is done. Now, know the cold smoking tips and try something new like frozen steak, how will you cook it? It is important to note that smoking a brisket in an electric smoker is a straight-forward process for both beginners and pros. However, overconfidence may adversely affect your end results. So better abide by the above procedure. Creativity is what makes a difference and thus is encouraged especially for the smoking experts. Your choice of the model of Masterbuilt electric smoker is the ultimate goal to successful brisket smoking. Brisket smoking time duration varies depending on the model you are using. The 10 hours stated in the smoking procedure is the least you should spend smoking brisket. Going beyond 10 hours upto 15 hours is still okay. Maintaining constant cooking temperature is the key top preparing the best brisket quality. For this reason, be as careful as possible with your smoking temperature. 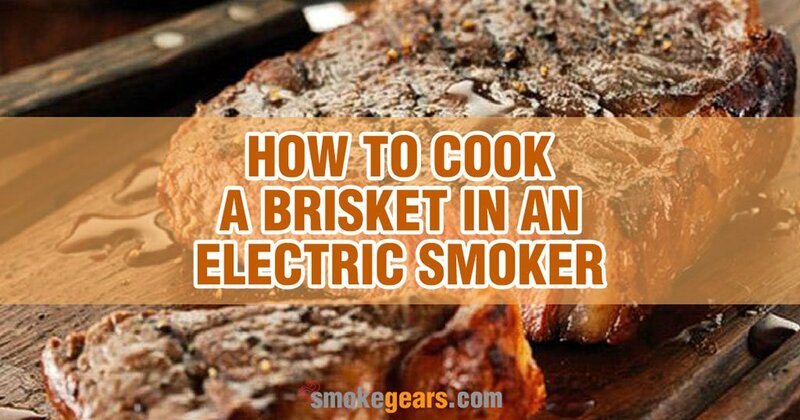 Basically, all you need for a nice start up is to master the above procedure on how to cook or smoke a brisket in an electric smoker.